How do you spark fear into governmental leaders? For V it was by staging a revolution. "The only verdict is vengeance; a vendetta, held as a votive, not in vain, for the value and veracity of such shall one day vindicate the vigilant and the virtuous." A simple mask can hold so much meaning. 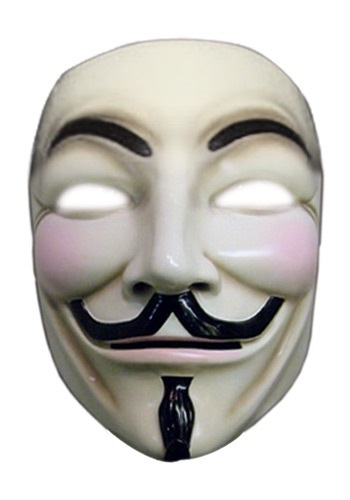 You can be like V in the V for Vendetta Deluxe Mask. This officially licensed mask is molded from the mask in the movie. It is made of plastic and inspires many that V is in fact for many things. The V for Vendetta Deluxe Mask fits with an elastic band and Velcro fasteners. Get out your black cape, and get ready for your next Halloween party. Or, get ready to bring a balance to those who want to control the masses.